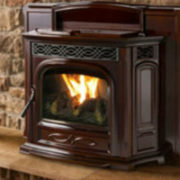 Who doesn’t love a cozy fireplace during the holiday season? 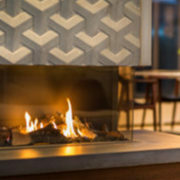 A fireplace often becomes the object that we all gather around to warm up after being out in the cold or to sit in front of and enjoy warm treats with our loved ones. It’s not surprising, then, that we love to decorate our mantels to celebrate the joy of the season. Finding out how to decorate your mantel can take a little patience and creativity, but with a few simple design tips, you’ll have a beautifully decorated mantel this holiday season. It can be easy to go overboard when decorating a mantel. 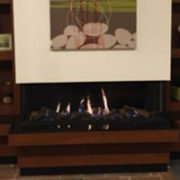 At Rettinger Fireplace Systems, we suggest keeping it simple and sticking to one color palette. You don’t want your mantel to be overwhelming to look at. So, pick up three colors—such as a red and forest green with maybe a splash of beige. You can even incorporate some silver and gold in the garland to top it off. Think about how to texture the space with some sheen and shine. Ornaments, glass containers, and stocking holders all add to the texture of a beautifully decorated mantel. Factor in proportion, height, and scale. At Rettinger Fireplace Systems, we suggest finding ways to incorporate proportion, height, and scale into the holiday look of the mantel. Start by adding a few taller objects to the end and add the shorter decorations to the middle. You can also layer items that have different heights so that your display has a little visual pop. Other ideas include hanging a mirror behind your display and layering greens with candlesticks in the front. 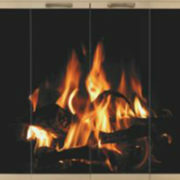 What’s a holiday fireplace without some festive garland? 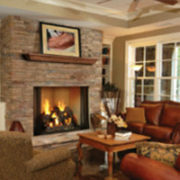 At Rettinger Fireplace Systems, we suggest using garland to provide proportion to your mantel display. Hang the garland ends no further than a third of the height of the floor to the mantel. Opt for colors like red and brown or simply green. Thick and dense garland also works best! 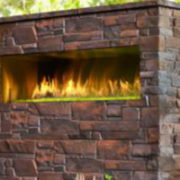 Whether you need a fireplace company in Camden County, or a fireplace installation company that serves another area in South Jersey, Rettinger Fireplace Systems is the name to remember. 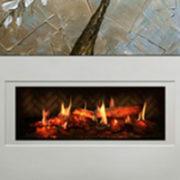 To see the types of fireplaces we install, please feel free to browse our site!